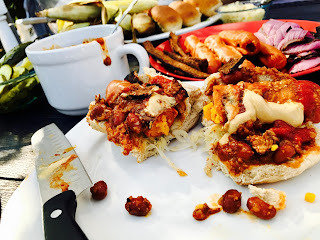 This blog has moved, however, this website will remain so you can search the archived recipes and content. Please feel free to enjoy all of my past blogs posts here, that span from 2010- 2017 and utilize the search and labels feature. 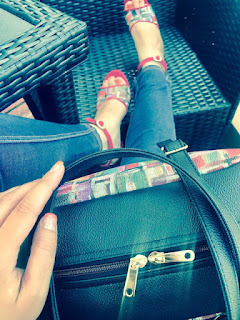 where I am still blogging regularly - business as usual! 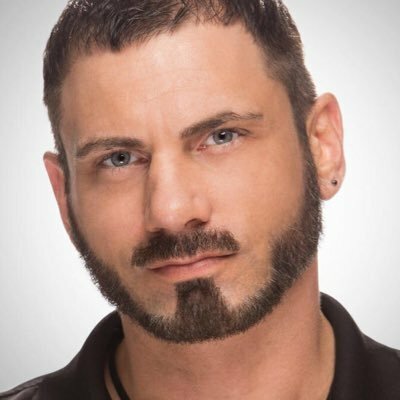 10 Questions w/ Superstar Pro Wrestler Austin Aries! So, I had the pleasure of talking with professional wrestler, Austin Aries, former WWE superstar, and widely known vocal vegan in the health food community. Whether you know him for his high-flying pro-wrestling moves or as the animal rights and healthy living advocate that he is, this interview where we talked about his new book FOOD FIGHT: My Plant Powered Journey from the Bingo Halls to the Big Time (which is described as a book "...not about veganism. It's not really about wrestling, either. It's about a decision every person has to make: Will you blindly color inside the lines that society has drawn for you? Or will you question the system, think for yourself, and have the bravery to make your own rules? "), his veganism and his future plans after the WWE, is a must read for you. I didn't really know what to expect of talking to Austin, I mean he is a huge superstar and also has a reputation for being a badass, but to be completely honest, he was one of the warmest people I've spoken with in a while. His telephone style was real chill and laid back, mixed in with cool, smart, informed, "woke", and we laughed too. He was really easy to talk to, like an old friend that you can just sit around and shoot the breeze with. So here is what we chatted about and the questions I asked him; I bet you're dying to know! 1) What got you into wrestling and was it your first sport? When Austin Aries was 4 years old, playing with GI Joe toys in fatigues, he recollected his first memory of experiencing wrestling, "I saw this guy come into the ring, I instantly became a fan and it consumed me", he also mentioned that when he first broke out into the wrestling world and when the opportunity presented itself, "I didn't really look back." 2) Is wrestling your passion or are you now finding your way to something else, like writing? Austin Aries grew up playing baseball and he wasn't fully sure what he wanted to do, but when wrestling became a passion, he said, "It provided me a platform for bigger things that provides a platform to do bigger things; spread a message." He talked about wanting to get people who aren't in a healthy place to "think about what we are putting into out bodies" and start focusing more on health and obesity, especially in youth. He wants to urge kids to, "...put down the soda and pick up a pressed juice", leading us to chat about his new book. 3) Your new book FOOD FIGHT is so interesting. If you had to sum up the book to your readers, in terms of what to expect and what it means to you, what would you say about it? "My journey came from normal circumstances and humble self discovery. By questioning what [food] is put in front of me, or, 'what is it?' and [the book] is about how I got here [as] a professional athlete on a plant-based diet; how the seeds were planted. And I want to plant seeds using my platform. It's about understanding you have a choice in your life and about your health." 4) It's so cool that you eat plant-based. How did you find this lifestyle and adopt it as your own? He started laughing and cheekily told me the answer to that is in chapter 3 and throughout the book, so people have to buy it to find out; we both had a good chuckle. 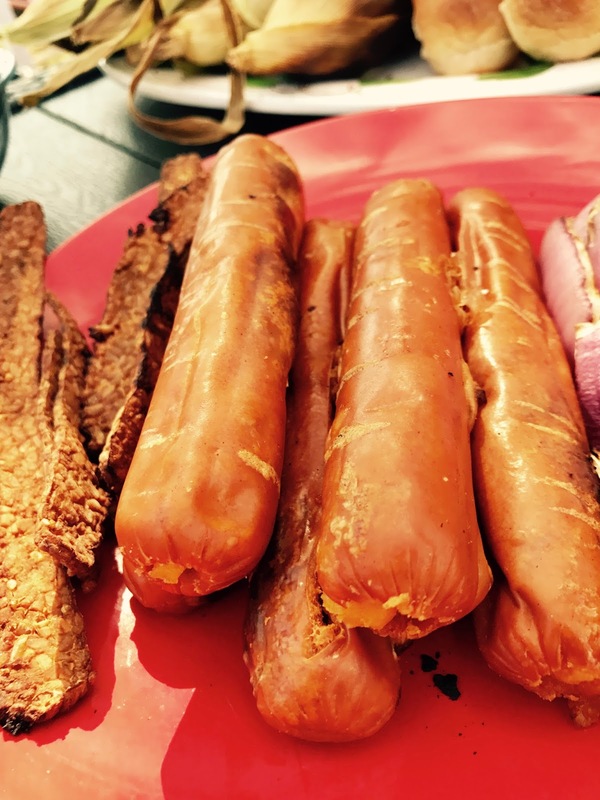 More seriously, he explained that his journey to veganism was a "learned behavior" and gave an analogy as an example, "Put me in the crib at 3 years old with a kitten, puppy, and piglet; I'm not gonna pet the kitten and make bacon, I'm gonna hug them all." 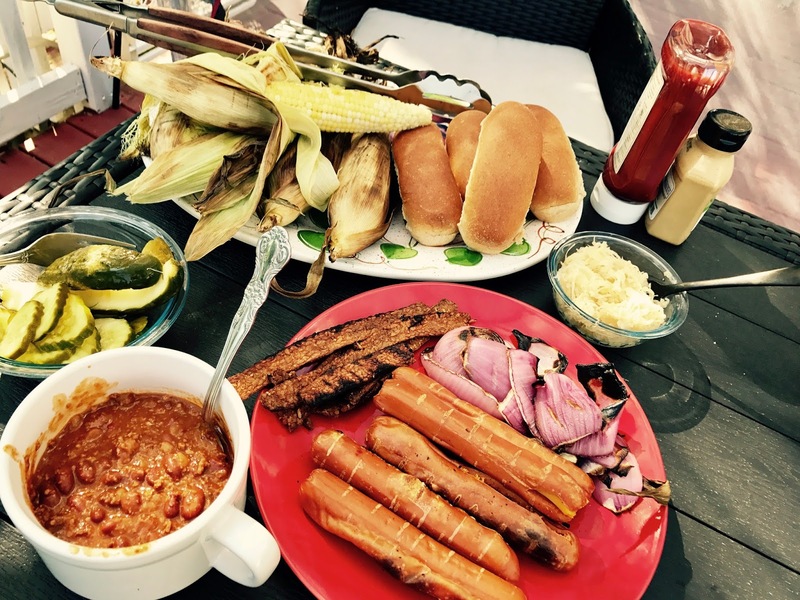 He mentioned that eating meat is also a learned behavior and recalled how he grew up in a hunting environment, but as a child didn't feel right about it, it felt "weird and gross" to him. He also strongly stated that we must invest in our health and the food we eat, noting how important food is to us, but it seems like not all people are paying attention, "I see in front of me unhealthy people everywhere; at the airport food court there are shorter lines for the healthy options and long lines for the unhealthy choices. 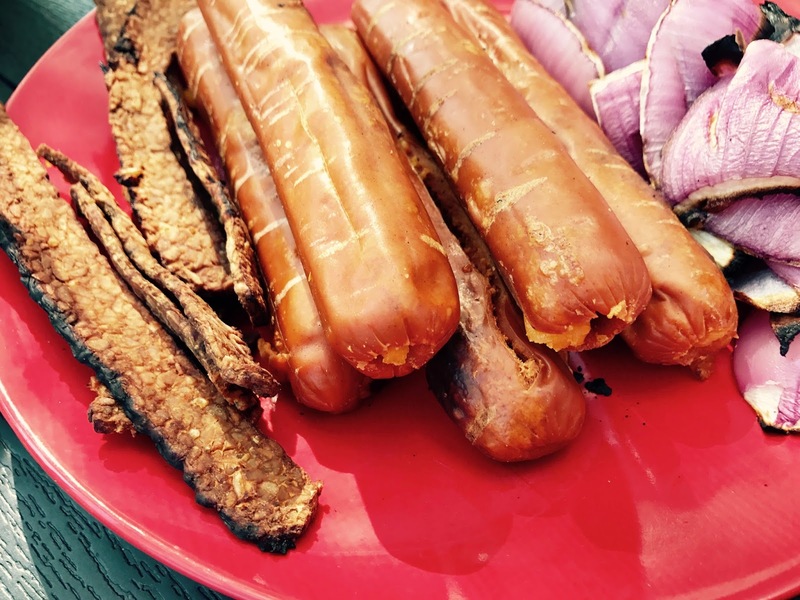 No one has ever had protein deficiency - what is the downside to improving our diets?" Amen! 5) Is your wrestling more improved since becoming an herbivore? How has your body and performance changed? "I stopped eating meat when I started wrestling. I liked to think it was keeping the inflammation down...", then Austin's cardiologist reported to him that his results were like that of a high schooler, so he knew for sure that the "Plant-based diet is where it's at." We also discussed how there has been the same debate in the medical world, early on, about tobacco and cigarettes, and we know now that they aren't good for your health; same thing with eating meat. 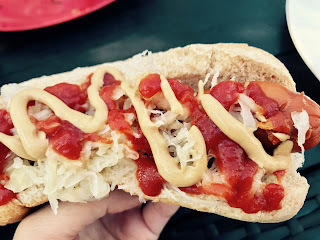 6) What's your favorite veggie food? "Pizza with cashew cheese or different personal pizza combos with veggie pepperoni or tempeh." Nice. 7) I read in the news and it was also a trending topic all over social media, that you and the WWE parted ways. In your words, what is the real scoop and what is next for Austin Aries? "No scoops, unfortunately. No scoops of cashew ice cream in my cone." BUT he did say that he has some other "big scoops" like exciting book stuff, a multi-city book tour, and a really exciting piece of news - he is acquiring a cold press juice company based out of Milwaukee that will specialize in organic yummies delivered right to people's homes! Austin also mentioned that his wrestling is on hold right now and he will focus on his book and the book's message. 8) Exciting stuff! I hope everyone gets themselves a copy of FOOD FIGHT. If you had to describe your book in 3 words, what would they be? "Interesting. Funny. Healthy (mind, body and spirit)." 9) If you had to describe yourself in 3 words, what are they? 10) To wrap up, what piece of advice would you give to all of your fans, that you would want them to truly listen to, take to heart, and take away? "Invest in yourself and believe in yourself. What you put in your body, food, are building blocks. Being healthy and mindful will pay us back in so many different ways. Believe in yourself and don't take no for an answer." Well said. Austin Aries was such a nice person to talk to and the conversation was so relaxed and easy. I told him that I didn't get a sarcastic vibe from him like he describes himself and he mentioned he thought he was being sarcastic a few times in our chat; I think he's just a really awesome dude with a good sense of humor. His passion and enthusiasm about life was also super motivating and inspiring. It is always refreshing to talk with people who embrace compassion, health and veganism the way Austin Aries does. Be sure to check him out on Twitter and he has info there about his book and upcoming projects. And for now, the Dirty Vegan is signing off - I hope your day is Austin Aries cool. Yes, You CAN Be Vegan & Wear Your Fuggs Too! PLUS My Vegan Shoe Collection! I opted for the sweater style this year. They can be worn several different ways, which is cute and keeps them versatile for different looks. First of all, I'm going to clear up what the term "Fuggs" is. 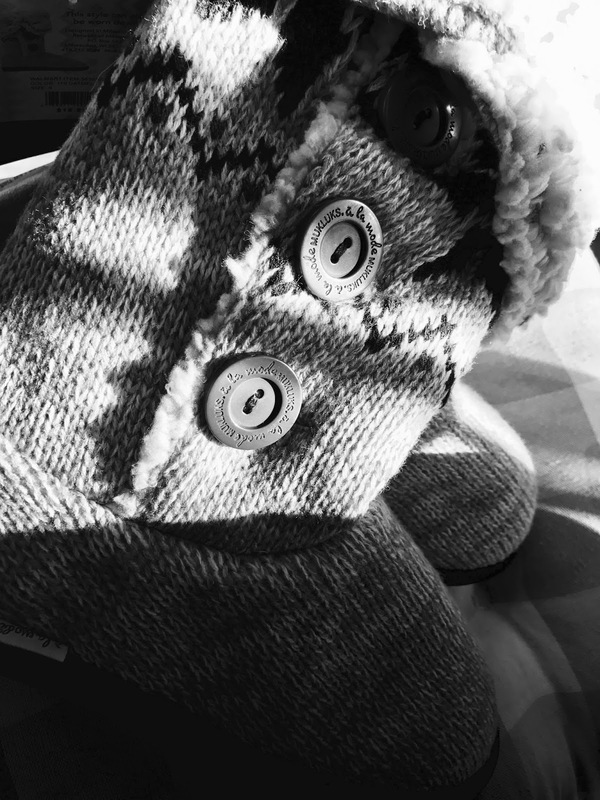 Fuggs are Fake Ugg-style boots; they are typically vegan and contain no animal products like leather, wool, fur or suede - materials that are not vegan-friendly. At least, my fuggs are always vegan. For years I wore a pair of vegan Airwalk fugg boots and they really were such great quality. I was able to put the Airwalks in the washing machine and dryer, and they really did last a very long time. Normal wear and tear happened, and I decided to get rid of them at the end of the winter season. The brisk fall air has set upon us, and I felt the need yesterday to get another pair of fuggs, remembering that I no longer had my pair. This type of boot is perfect for throwing on when you have to run errands or have something laid back to go out and do. There are so many brands that offer vegan boots of this style, that go great with slouchy or boyfriend jeans, leggings, sweats, and other casual outfits. They are normally inexpensive, so that is another wonderful reason to opt for the man-made, cruetly-free version of these boots rather than the outrageously expensive and ridiculously cruel ones that have made this footwear popular to begin with. So what are you looking for? In order to choose a cruelty-free fugg boot, read the label and look for the words: vegan, all man-made materials, fabric upper and all-man made or rubber sole, faux-fur or polyester lined, etc., ensuring that all parts of the shoes are, in fact, vegan-friendly. You can contact companies too; ask them about their glue, if it isn't available on their website (please note that most shoes made in the United States and in modern days, typically are not made with glue that contains animal products, but it never hurts to research or even investigate with the company to find out if your particular batch contains the vegan glue or not. 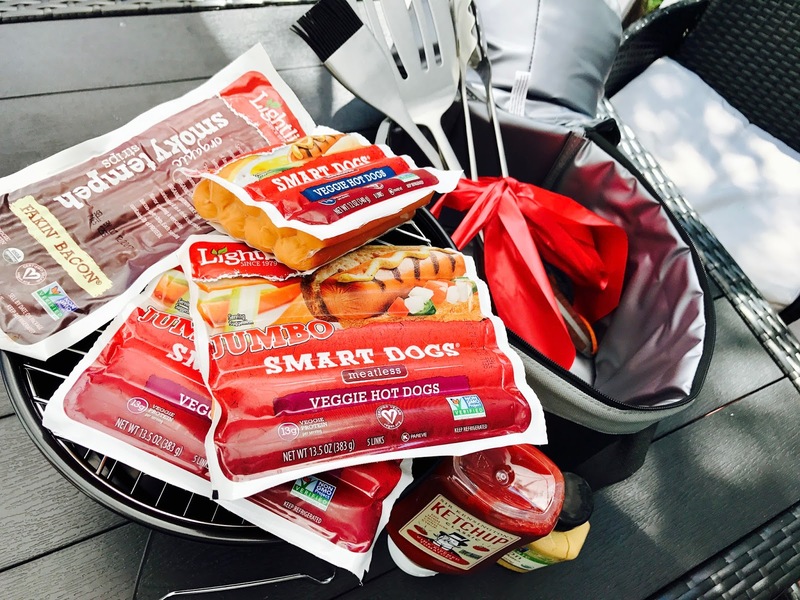 Some companies do not list their product as vegan, since they may switch glue brands throughout processing, so since they are unsure, or things can change, to play it safe they declare that it cannot be called 100% vegan; that is where asking the company if they can look into a particular batch or lot, might be helpful if the company is willing to work with you). Also, don't just rely on the label; examine the product to be sure the fur is genuinely faux. Personally, I can usually tell when a material is vegan-friendly or not, but it may take practice, especially if you are knew at it; it is just a matter of experience, that is why knowing the brand is reputable helps with trusting the integrity of the product and the labeling on it. So, since I was out running errands yesterday, I decided to keep my eye out in the stores, for a pair of replacement fuggs. I lucked out by immediately liking a pair I found at Walmart (in the above picture) and I was able to identify as free of animal products. They only cost 20 bucks, which is all I really wanted to spend on shoes since I have so many to begin with. Which takes us to my vegan shoe collection. Then the next shelf down: More kitten and wedge heels and three pairs of stilettos (one strappy and one appropriate for any time of year, both black, for practicality - unlike my previous shoe collection that was way too many pairs and felt maddening) - and at the top my absolute favorite heels in my entire collection, my gorgeous Kweder vegan ones! 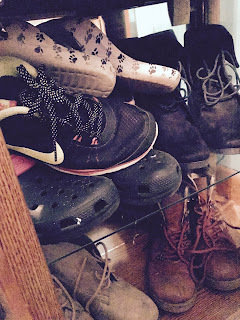 My last two shelves are: junky shoes like flip flops, crocs used for gardening, boots that I wear in the fall and winter, and my vegan nike runners. 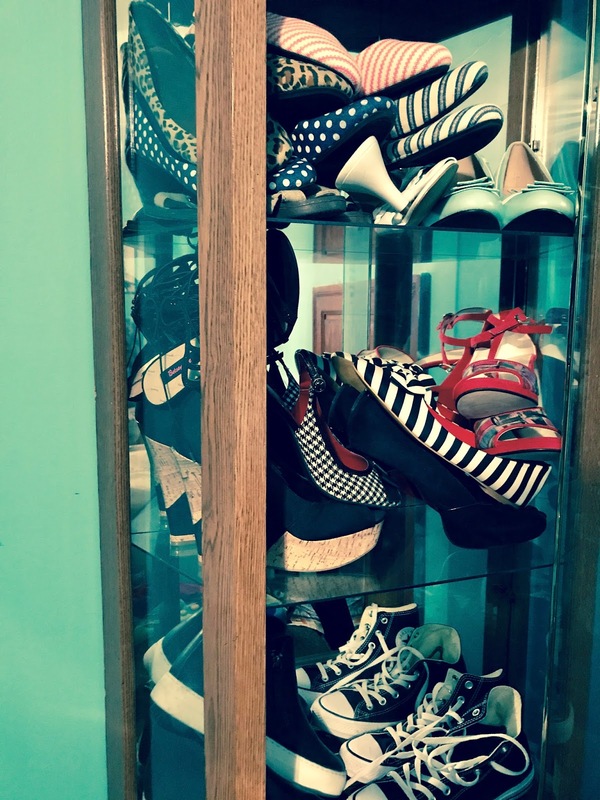 My vegan shoe collection has dwindled over the years because I long for simplicity in life, plus it was getting a very diva vibe about it, which I'm not always into; I like to try to live pretty simple and low maintenance whenever possible. 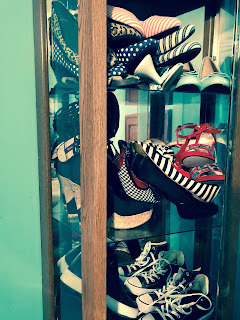 I like to keep shoes that are versatile for various outfits and also at least one particular pair for each style of shoe, in order to have an option for any occasion (i.e sandal, wedge, stiletto, ballet flat, casual sneaker, running shoe, stuff like that). I have shoes that range from very inexpensive to the more luxury vegan shoe, but my go-to to purchase are always on the more moderately priced side of things since we walk everywhere in our shoes and they get dirty and beat up, therefor it isn't practical to have a shoe collection that costs more than your car does. A good way to get vegan high-end shoes is to wait for them to go on sale, making your investment feel a little less Mariah Carey, but you can still achieve that rich and polished look that most of us often desire, especially in particular social situations where it is just plain necessary. I like to clean my shoes by vacuuming off any dirt particles or fuzz prior to storing on the shelf, and cleaning with a damp cloth if needed. If I don't have time to vacuum or clean them, they will sit at the doorway until I have time, since I don't like to put away my shoes with the other shoes when they are dirty. So, what do you think of the fugg style? Are the falling leaves, crisp air and pumpkin spice everything making you long for a pair of these boots to match your mood, or are you just plain over this craze? And for now, the Dirty Vegan is signing off - and off to make a soy pumpkin spice latte! First Ever HASCON - SO AWESOME! I was invited to the first ever Hasbro HASCON in Providence, Rhode Island this month... and it was AWESOME! I love my job! So HASCON was three days, a Friday, Saturday and Sunday, and I attended all three days. It was crazy fun between celebrity appearances, panels of comic writers, movie voices, creators, producers and more, as well as so many amazing booths, props, interactive experiences, activities, food, and even a Flo Rida concert! Here are some pictures, but honestly pictures just don't do it justice because there was just so much going on at all times, everywhere that you looked; in order to get the full effect, you'll have to get tickets for next year and attend HASCON yourself - you won't be disappointed! And if you were one of the lucky ones to catch my LIVE Periscope broadcasts and were seeing my tweets, you were probably wishing you were there too, but I tried to do a decent job of showing you all everything that was going on and taking you along with me via social media (I covered so much of this event on my social media accounts, so if you missed it, please check them out!). There were panels going on each day. My favorite was the Transformers panel and watching the real voice of Optimus Prime! So many models and props, it was outrageous in a good way! I loved all of the Guardians of the Galaxy stuff! If you were watching my LIVE broadcast, you saw the actual Star Lord costume prop from the movie, which was so wild so see, and saw me dancing with these baby Groot toys. They are so cute and made by Hasbro, available where toys are sold. I also freaked out with all of the Star Wars stuff! So cool. My buddy BB-8, pictured above. And ALL the other Disney stuff; I was in my glory! Had to stop and take a picture with my robot buddy, BB-8. I have such a soft spot in my heart for cute little AIs. All the My Little Pony stuff was so awesome. Yep, I'm just a big nerd kid at heart, really I am. I think Spider Man fell in love with me a little that day... I think I fell for him too. I had such a blast at HASCON and they did such a beautiful job with everything. Every tiny detail was so beautiful and thought out. For their first year hosting this event, Hasbro and partners did such a wonderful job that had you not known it was the first annual HASCON, you would think they've been doing this particular event for years. I bet next year will be even better, if that is even possible, and I can't wait to go again! Big thanks to Hasbro for sponsoring my three days at HASCON and providing the tickets. And for now, the Dirty Vegan is signing off - I hope your day is filled with smiles, sunshine and Rainbow Dashes! 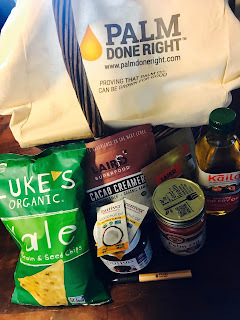 I got this sweet goodie bag in the mail from Palm Done Right and after reading about the good they and the companies they are partnered with are doing, I definitely had to share. 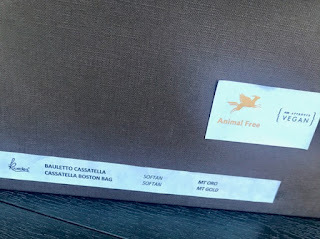 There were so many goodies in this cool reuseable canvas tote, from so many companies that I recognized and that I love, so it was awesome knowing that the palm oil that my favorite brands use is not only harvested using responsible methods, they are also conscious and thoughtful in those ways as well. "We've all heard about the impacts of palm done wrong in Malaysia and Indonesia. Endangered animals brought to the brink of extinction, primal rain forests destroyed, farmers being driven off their lands, peat fires that cause devastating air pollution throughout the entire region. Now it's time to hear the other, happier, side of the palm story. A story where animal habitats and rain forests are preserved, where farmers are empowered, where communities thrive and the environment is nurtured. This is the story of Palm Done Right." It is just super reassuring to see all that the Palm Done Right organization is doing for preservation, for the farmers and other people involved in this work, and also for all the natural foodies that can now enjoy the amazing health of red palm oil and palm products without contributing to any harm to the environment and rainforests, to animals and their natural habitat, or to the residents living in the areas. The cultivation is doing a lot of good and I love seeing such focus on positivity and nurturing of nature and uplifting this palm farming community, doing it the right way. Bravo! 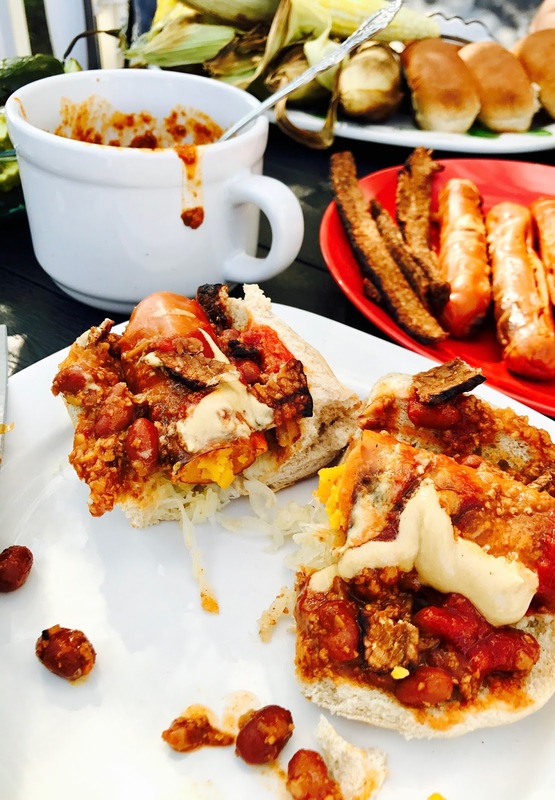 You can check out Palm Done Right on social media to keep up with what they are doing, including with their brand partners (so many great vegan brands associated with Palm Done Right, and a personal favorite of mine is Nutiva, such yummy stuff! ), on Twitter, Facebook, and Instagram. And big thanks to the folks at Palm Done Right for sending me this generous package of goodies to try and enjoy! And for now, the Dirty Vegan is signing off - have a sunny day! The Dirty Vegan for Kweder Fashion! 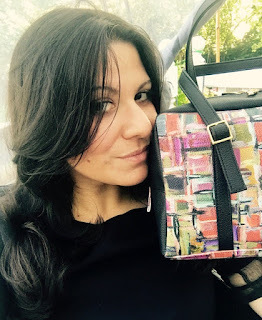 When I found out about the vegan fashion company, Kweder, I was so excited because not only is their stuff, like their handbags and shoes, totally chic, they are also animal and people friendly! There is just so much I love about this company! But before we get into the details, and look at the hot new items that they sent to me to try and enjoy, let me talk about how beautiful the package arrived to me! This box managed to travel all the way from Italy to me here in Boston, USA and it arrived looking gorgeous! Such a pretty retro looking hat box style and it is sturdy! I am going to use this box for years to come! This box reminds me of when my grandmother would have her old hat boxes up in her closet from the mid-century and they still looked absolutely amazing decades later. This is that same type of box. Ok, enough about the box - but you know me, I love gorgeous packaging! Actually, one more thing about the box - love that it says animal-free and vegan on it! So cool. And then I opened this beautiful chocolate brown box with gold lettering and angels began to sing...just kidding! But in my mind it did happen. I present to you, the Cassatella Sandal and the Cassatella Boston Bag (how appropriate that this Boston girl has a perfectly fitting bag now!). These sandals are absolutely stunning! They are comfortable, they fit so perfectly and true to size. They have such a nice feel to them and that is due to the weatherproof and luxurious Alcantara® suede with waterproof Softan® embossed microfiber vegan leather. They are padded, so again, majorly comfy for a heel, I must say. And I love the chic gold buckle. The print on this shoe is so artsy and fabulous; I am so in love with this item and I'm already showing off these sandals every where that I go. 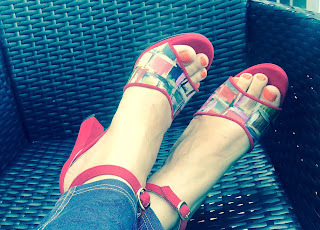 As you can see, the Cassatella sandal is a lovely and versatile shoe that can be dressed up or down. I'm seen here wearing them with skinny jean jeggings and a semi-casual but chic blouse. I also suggest wearing them with a little black dress, a red dress, a maxi dress or skirt with a cute crop top or peasant blouse, pleather shorts and tight tank top with a fitted suit jacket over it all, and with jeans or pants. As you can see, you can wear them with ANYTHING. What I especially love about this shoe is that the colorful print offers many different style options as well. 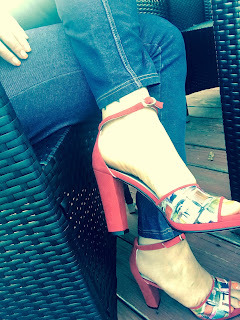 So not only can you wear these sandals with a black or red styled outfit, you can choose any color in the print, so basically any color will go with this fabulous style! And as you can see I am sporting the matching Cassatella Boston Bag! Look at that golden hardware sparkle and shine! 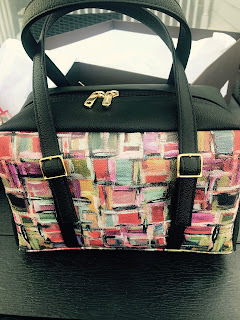 I really love that you get the art on the bag which is so chic and unique, so you get the style, but also durability in this bag. It can sit on your shoulder, forearm or hand. The size is great because it isn't teeny tiny but it's not over-sized or gaudy either - its the right size for a girl living the city life. They definitely nailed the Boston bag and what a boston bag means. You have two good sized inner pockets which can handle your small tablet or your cell phone with no problem. It has enough room for your daily needs and is a wonderful day to night purse, taking you from your work day to nightlife easily and fabulously! I love the shiny gold details on the zipper hardware, buckles and feet, and the zipper pulls are hearty with universal sized holes for a pretty lock (awesome for travel and carry-on bag comes to mind for me for sure). I know for certain that this bag will catch a lot of attention - it already has! Everyone who sees it has asked about it! Put your feet up when you are wearing Kweder heels, because you won't be able to stop staring at them and how amazing they make your feet and your wardrobe look! 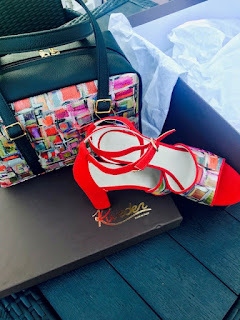 Kweder shoes and handbags definitely take your style to another level. I feel so sophisticated using these products. 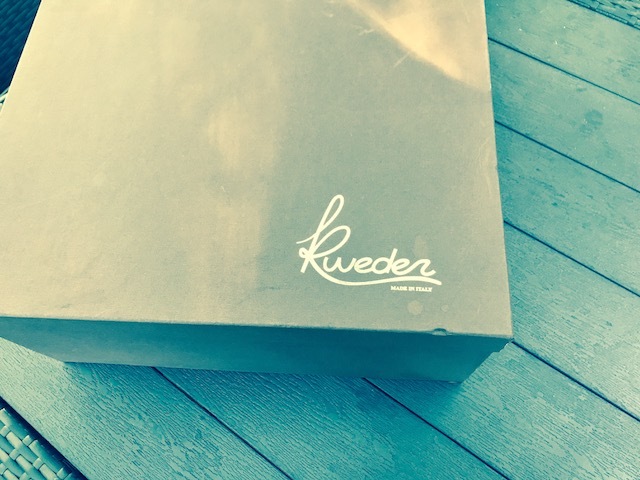 This is the first vegan company where the quality not only matches those fancy other non-vegan designers, but in my opinion, Kweder is far superior to those brands. You get the quality and luxury Italian made shoe and handbag but in a vegan product. I am so impressed. "A similar fashion production enhances beauty, quality, craftsmanship and ethics, highlighting how to create a fashion item according to the preservation of the world we live in." 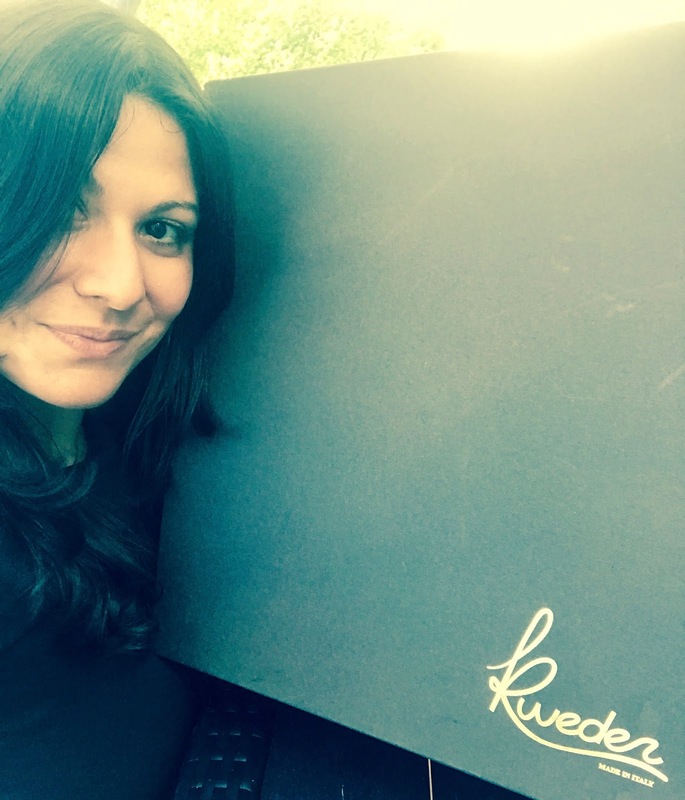 As an Italian-American with family roots in Italy and Sicily myself, I feel a deep connection to Kweder and to what these ladies are doing by changing the fashion game and providing a products that doesn't harm animals, people, or the environment. 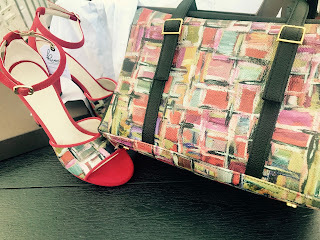 I am absolutely grateful to the company for introducing their fashion philosophies to me and for their generosity of sending me this strikingly beautiful shoe and handbag set. I am a huge fan of Kweder now, and this is exactly the type of fashion staple that I have been searching for for quite some time. I love fellow women who are changing the world; the Kweder sisters are doing it, and in style, might I add. You can follow Kweder on social: facebook, twitter, google+, pinterest and instagram! I really enjoy following their accounts for the cool posts and style inspiration. And for now, the Dirty Vegan is signing off - stay beautiful, fabulous, but above all else cruelty-free! 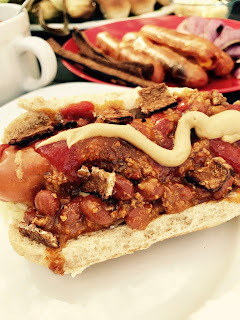 This blog post was sponsored by Kweder.